In today's insurance environment, your business needs every edge it can get. Shopping for the best health insurance plans and administration of those plans can leave your human resources department over burdened. The professionals at Mark Anthony know where to get the best coverage at the lowest prices and our administation services relieve the burden from your human resources and payroll departments. Health Savings Accounts: Employers and Employees can both contribute to a bank account to cover healthcare related expenses, even if it is not covered under the group medical insurance plan. Contributions are tax deductible to either the employer or employee. Balances in the account gain tax deferred interest. Unused bank balances roll over to the next calendar year. Health Reimbursement Arrangement Plans: Account is funded by employer to reimburse employees for incurred healthcare expenses. The arrangement works best with a high deductible health plan, allowing the employer to save premium. The employer controls the choice of carrier, plan design and the disbursement of money from the account. Group Term Life for the employee (up to $50,000 worth of death benefit coverage). Flexible Spending Plans: Allows employees to pay for out of pocket expenses on a pre-tax basis. These expenses include deductibles, co-pays, coinsurance, prescription drugs, eyeglasses and day care services. Flex plans work great with plans that have higher co-pays and deductibles. Employees that contribute to a flex plan experience an increase in take home pay. COBRA Administration: COBRA enables employees and dependents who no longer qualify under an employer provided group benefit plan to continue insurance under the group benefit plan. If you had over 20 employees on at least half of the business days in the prior calendar year, you must comply with COBRA. COBRA applies to group health, dental, vision, flexible spending accounts, health reimbursement plans and retiree health plans. Save money and time for your HR and payroll departments. We distribute all notices and complete billing and collecting functions. Stand Alone Prescription: 56,000 pharmacies nationwide, including major chains and independent pharmacies. The program assists clients in reducing the cost of their prescription. There are no exclusions, no pre-existing conditions, no annual maximums, no claim forms to file and no deductibles. Our state-of-the-art systems combined with our industry expertise allow us to find the best protection at the lowest possible rate. Not only will we save you money, but we'll provide your employees with the kind of peace of mind that they deserve. Call us today at 908.654.9500 or click here to get started by filling out our Census Data Form. 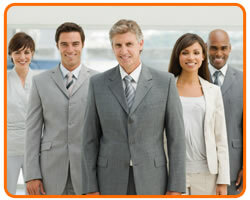 One of our group health insurance experts will be happy to assist you.